A captivating personality goes a long way for any dignitary, even a fictional one from the Star Trek universe. Ilon Tandro, released in the Blaze of Glory expansion, is no exception. Blaze of Glory was a major release in 1999 that improved player interaction by revamping the game's battle mechanic and supplementing the existing capture-related cards. Ilon Tandro's skills (VIP, Diplomacy, ENGINEER and Treachery) and Staff icon are a mixed bag. VIP with Diplomacy is very common, but the added ENGINEER... not so much. And Treachery, though common for Cardassians, is rare for the Federation and is needed to pass dilemmas like In the Pale Moonlight. The ability to capture any one opposing personnel is what makes this dignitary shine. 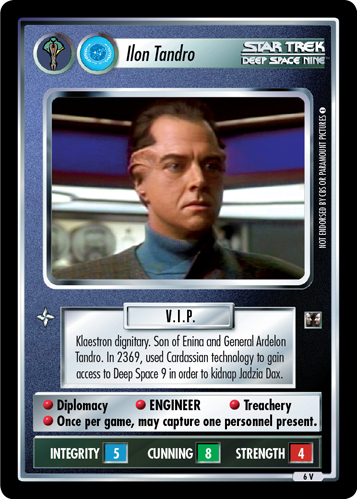 In Cardassian mode, Ilon Tandro has access to a wealth of capture cards to complement his special skill. Need a captive for Awaiting Trial? Send Ilon Tandro. Labor Camp short staffed? Send Ilon Tandro. Instead of relying on an opponent to stumble into a trap, send Ilon Tandro out early to implement your capture strategy. Ilon Tandro's role in a Federation deck is not as clear cut. Due to battle restrictions, the Federation player must always be more creative when it comes to player interaction. Ilon Tandro's strategic possibilities are limited, but no less powerful when his capture skill is used at the right time. Is your opponent's deck fueled by single personnel like Deyos or Barry Waddle? Send Ilon Tandro to cripple their strategy. Or if you're playing SCIENCE-drain, use Ilon Tandro to capture a just-played SCIENCE x2 personnel before your opponent encounters and easily overcomes all your Scientific Methods.